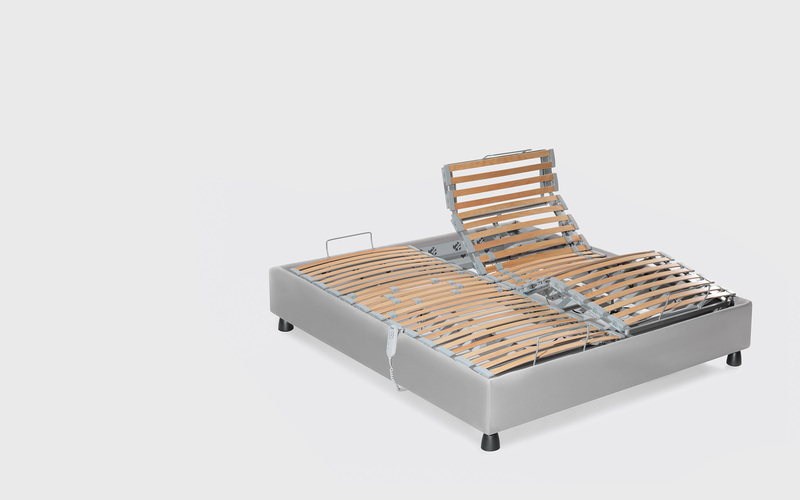 Total Body, the Flou bed system result of a journey that Flou started many years ago, with the production of its beds that fired the imaginations and dreams of millions of people in Italy and across the world. The ultimate destination of the journey is total wellness when resting rest. However, there is also an additional driver seen in those people with research, discovery and innovation embedded in their DNA. They have an almost innate desire to look to the future for even further improvements. The Importance of Each Individual Component for Total Wellness. 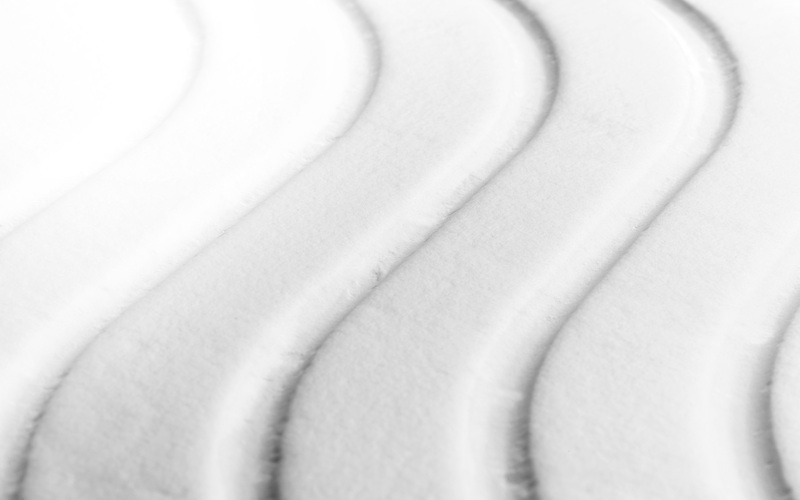 By applying the most advanced studies, the research into new materials and the most innovative technical processes to the traditional bed components, today Flou is in a position to present mattresses, pillows, duvets and bedlinen sets that are avant-garde and designed to accommodate all aspects of sleep, posture, microclimate and microcirculation. 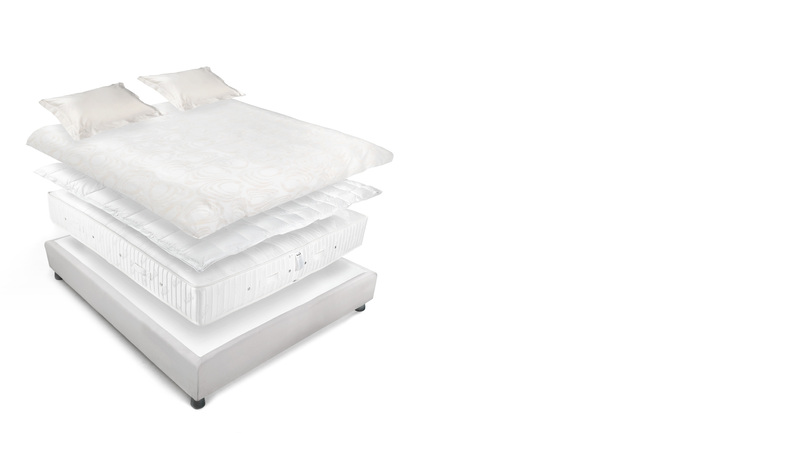 Total Body is an innovative system that combines all of the components associated with sleep, the mattress, the four-seasons duvet and pillows to provide immediate benefits to anyone using them. Thanks to the easy elimination of toxins, the Total Body system allows the body to recover more quickly from trauma and stress, with regeneration of all of the energy necessary to face the new day with renewed vitality. what are the essential ingredients of wellness? 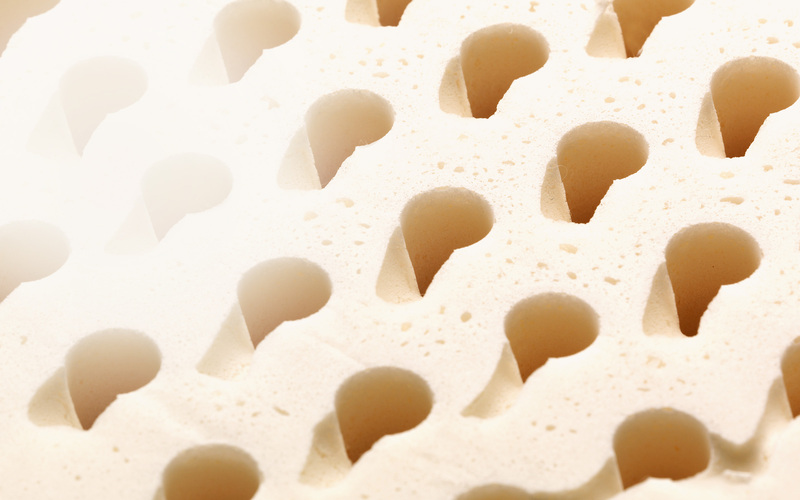 Every Flou mattress is available in a range of filling materials and these allow each person to choose the mattress that best suits the needs of his/her body and corresponds to their personal idea of rest. 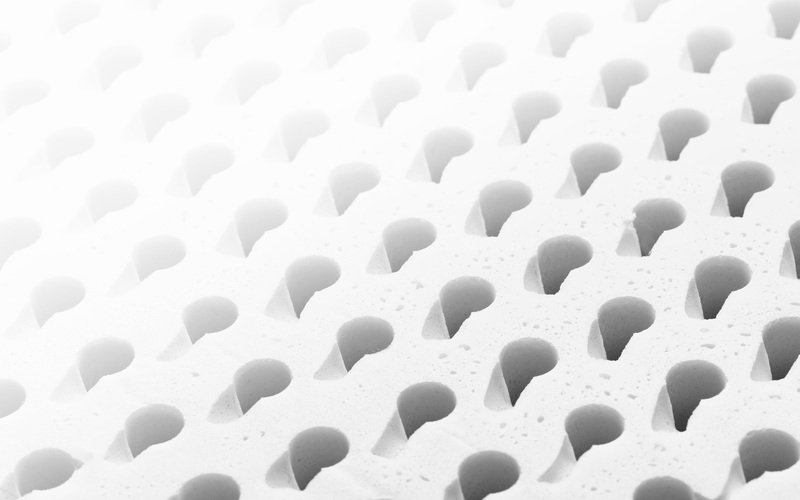 This is an exclusive padding consisting of bioceramic fibers enriched with silver ions. This innovative composition has been studied to stimulate the capillary vessels and boost the blood circulation. Moreover, Total Body provides an efficacious barrier to protect the human body against attack from dangerous bacteria. By exploiting heat energy produced naturally by the human body, this innovative bioceramic fiber potentiates the microcirculation and improves the body’s immune system. As a direct consequence, the microcirculation is stimulated and the process of cell-ageing slows down. By improving the blood circulation during the night, Total Body helps the body eliminate toxins and excess acidity. This means that the body will maintain an excellent state of wellness and recover more rapidly from trauma and stress; people will always wake up refreshed and ready to face the day ahead. 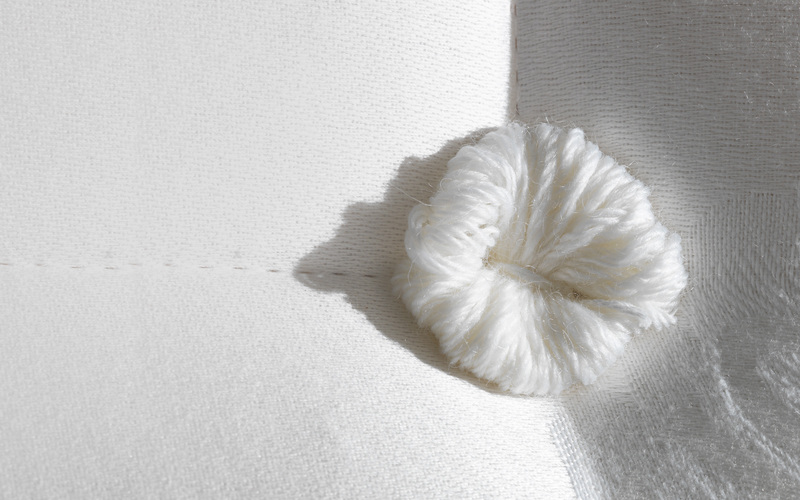 Warm and soft to touch, the pure white new wool used by Flou is a completely natural protein substance that has unusual elastic curls. 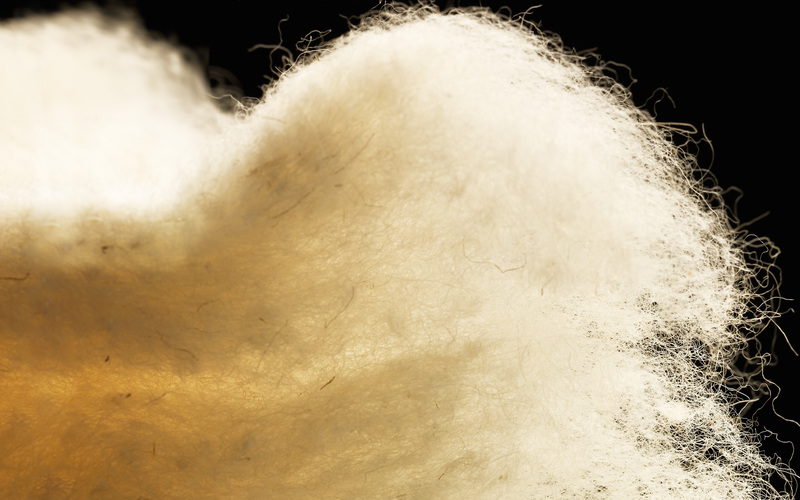 Thanks to its structure, this material has high hygroscopic and heat insulation properties, meaning it is resistant to dry heat; it regulates the temperature and absorbs damp and perspiration thanks to the air trapped between the fibers. This is extracted exclusively from the mature cotton plant pods. 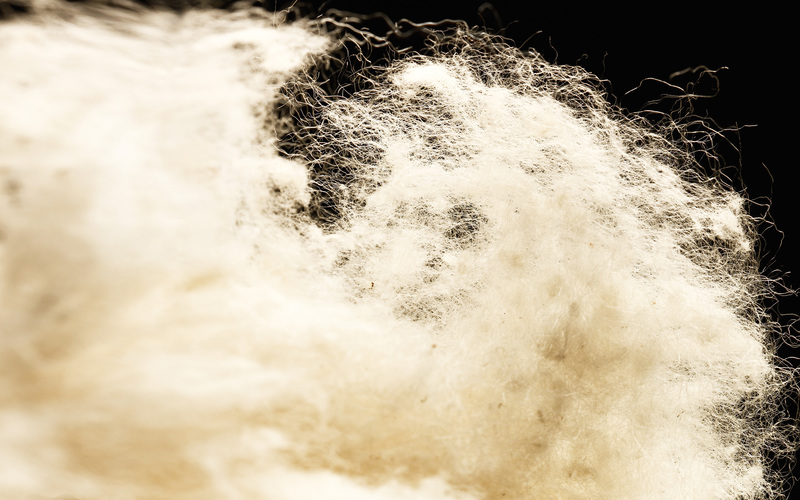 The special combing technique for the cotton used by Flou creates a layer of ideal thickness; it is soft and strong and has excellent hygoscopic properties. Flou Latex is a natural material with the greatest elastic properties known; its instantaneous ability to return to its original shape, even when compressed or stretched, positions it among the bes ergo-anatomical materials used in the various layers of the mattress. 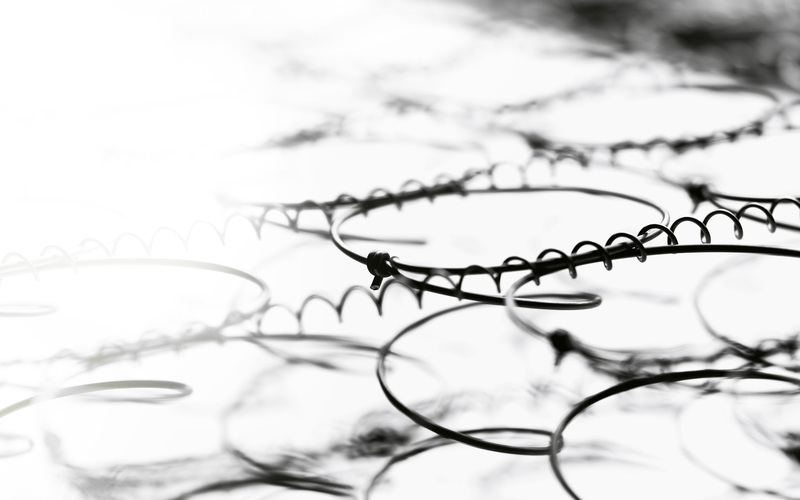 Recent studies completed in the USA have shown that products in latex are three times more resistant to house-mite than all other commonly used materials. 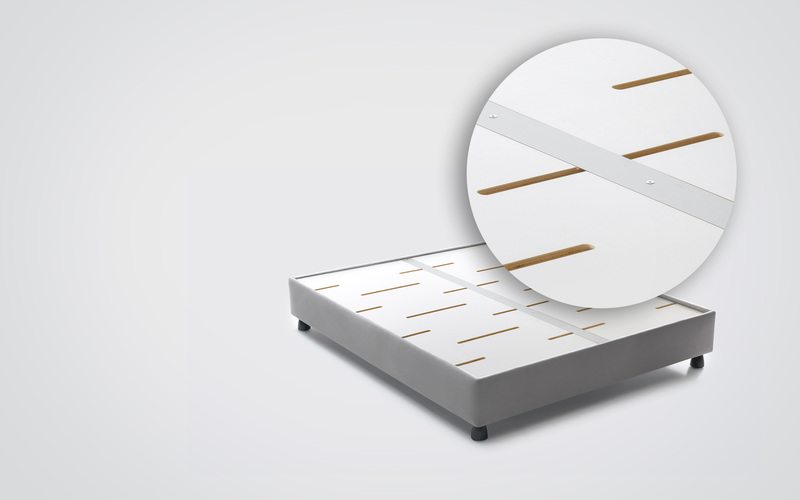 The Flou mattress collection summarizes the value of each individual product. From the products made by hand, following in the footsteps of tradition, to the most innovative developments, the expression of research and the latest technology. the maximum level of innovation. the natural aspects of rest. 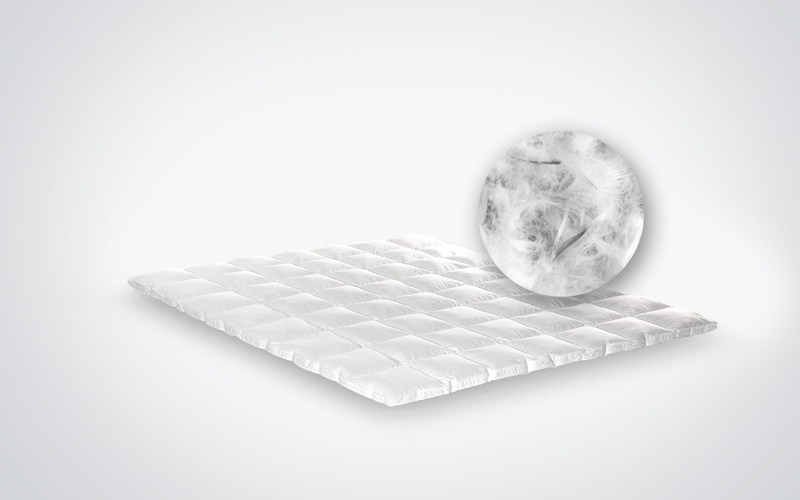 Produced in 100% natural latex, this mattress satisfies the demands of people who love living their personal wellness in perfect harmony with natural products. The new Flou Memoform line is a concentrate of two technologies that interact to create ergonomic solutions and a unique level of comfort. Maximum comfort and support for the back is guaranteed by the total independence of the springs and the way they adapt perfectly to the body. a strong link to tradition. Anyone who has his/her heart set on the 'traditional' mattress will love the Spring mattress for its basic qualities of comfort and hardness. it’s always best to know what is underneath. 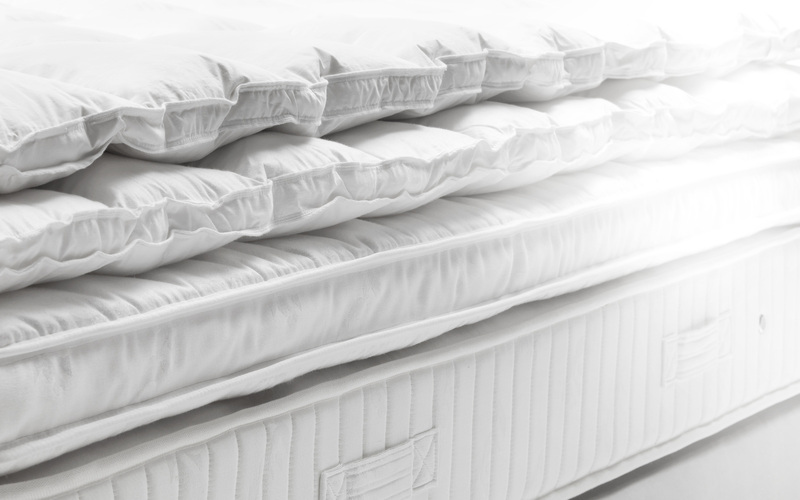 The Flou sommiers and the bases were developed as the ideal complement for the Flou mattresses. Studied to create the ideal support with the right degree of rigidity and comfort, the Flou bases achieve perfect equilibrium with the mattress and exalt its qualities. 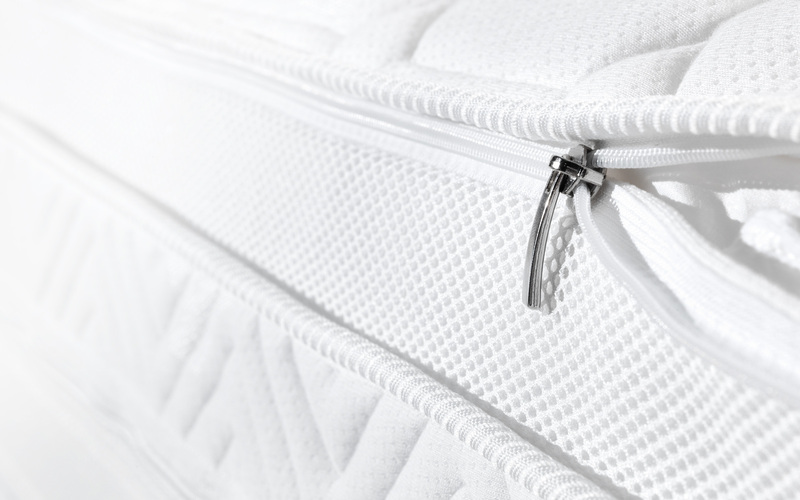 In addition to guaranteeing an excellent level of comfort when combined with any kind of mattress, the sommiers increase the pleasure of sleep and prolong the lifespan of the mattress. The storage base is an indispensable feature for anyone who needs to maximize their living space; however, they will not compromise on any of the bed’s excellent quality or the revitalizing properties of their rest and relaxation, while preserving the ease of use of the storage compartment. 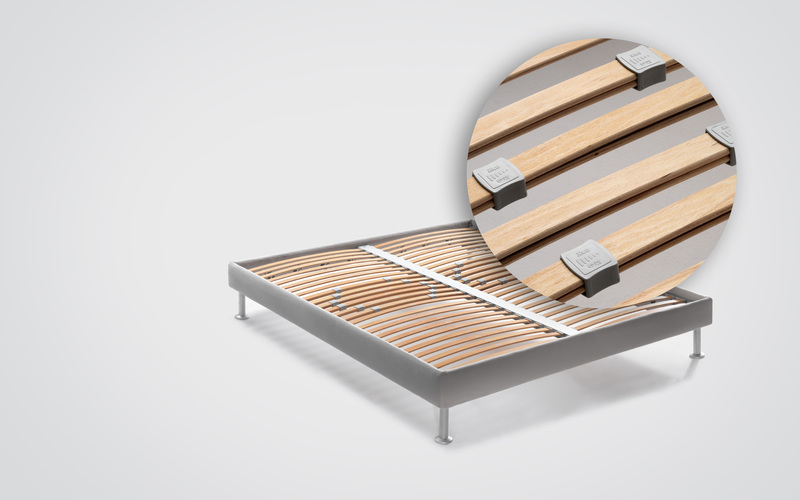 This base is available with three types of mattress support: with fixedslats with rigidity adjustment, with slats and with orthopedic base. The Flou pistons are fitted with sophisticated technology with 2 fixing positions that consent optimal balance for both light and heavy mattresses. 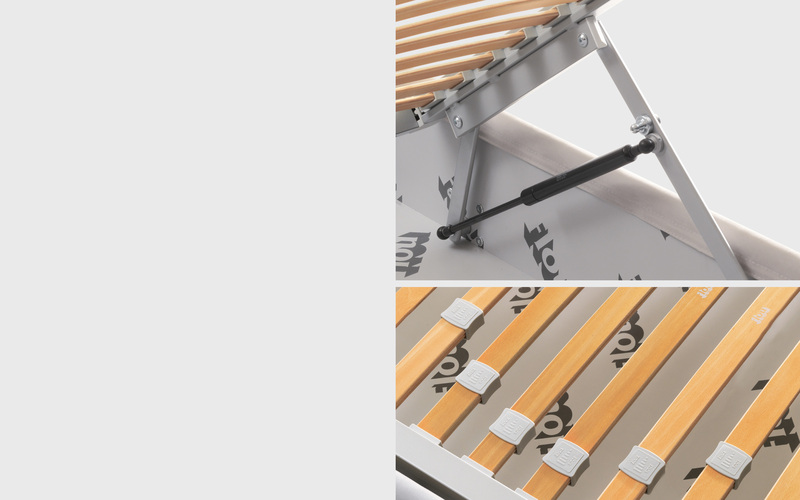 Double slats in the back area with cursors to allow regulation of the slat rigidity. 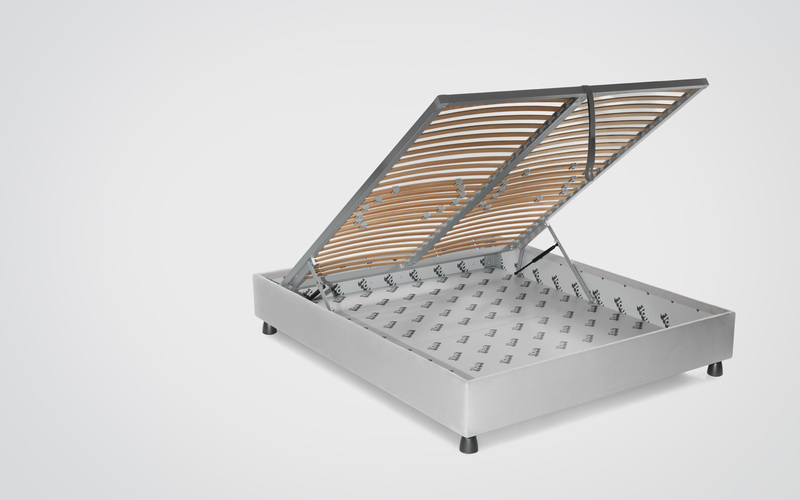 The mattress stop device at the head of the bed is a system that blocks the mattress when the mattress support is raised, preventing i t from sliding. Long strap to easily lift the mattress without bending your back. 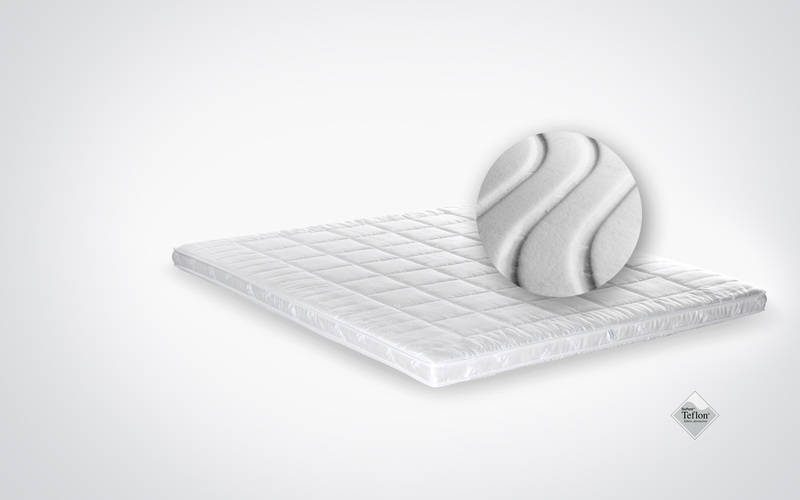 Base available with mattress support with adjiustable slats or with orthopedic mattress support. 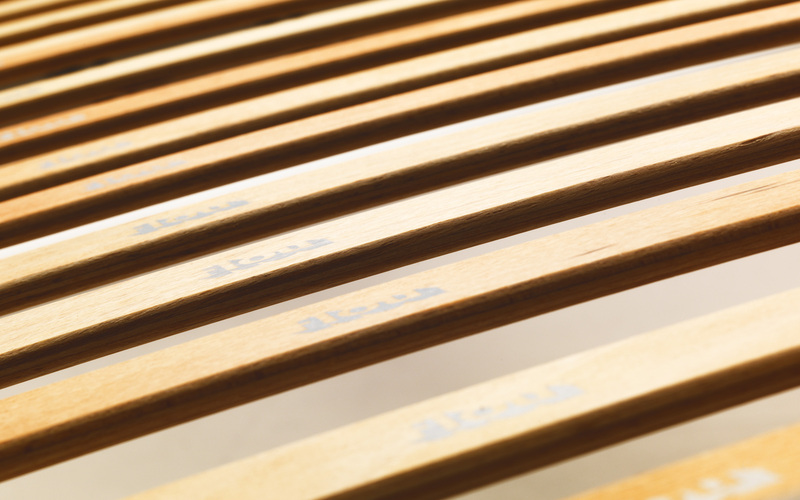 This support consists of multilayer beechwood slats and is fitted with a system that adjusts the rigidity of the back area, allowing personalized comfort to suit requirements. 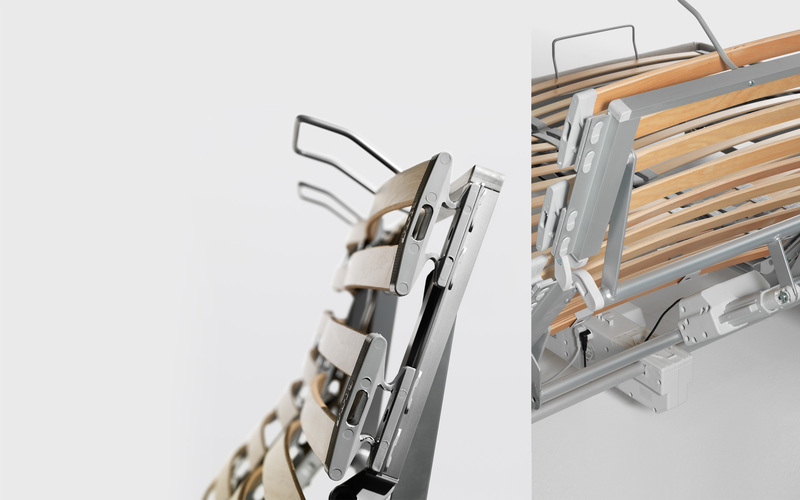 It can be used with all of the mattresses in the Flou range and is delivered in kit form to facilitate assembly even incompact spaces. 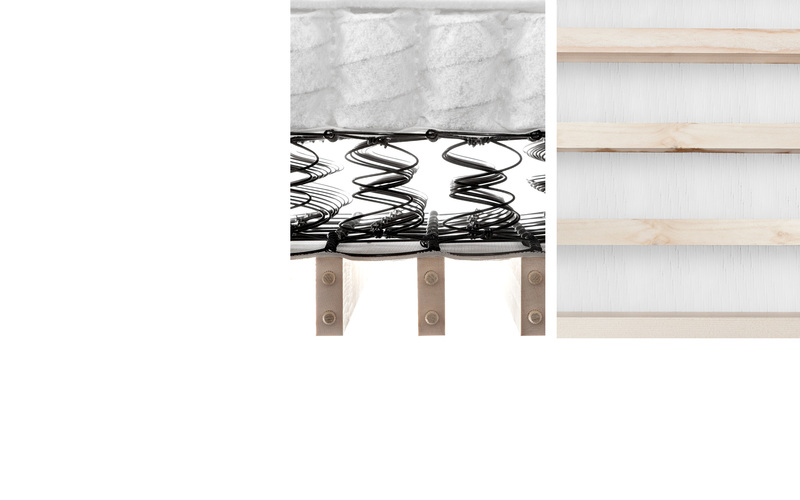 This support can be used with all types of spring and pocket spring mattresses; it consists of two panels of beech multilayer that guarantee firm support and, thanks to the special slits, facilitate the ventilation of the mattress. It is delivered in kit form to facilitate assembly even in compact spaces. It can be used with all of the mattresses in the Flou range and is delivered in kit form to facilitate assembly even in compact spaces. 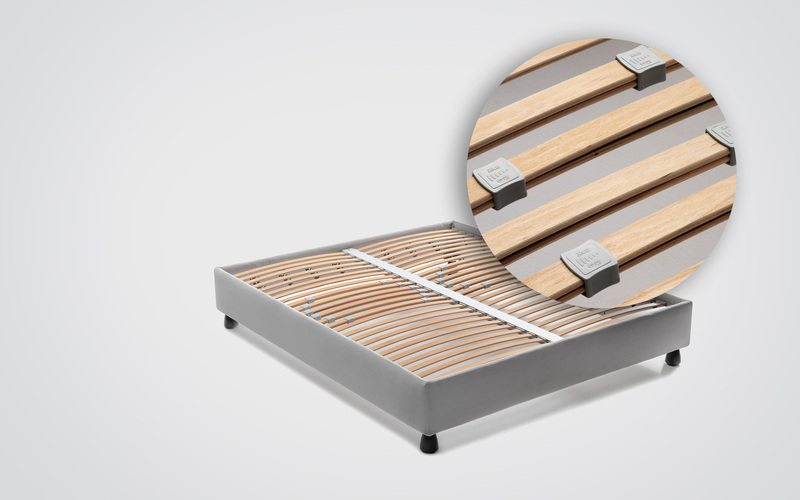 The Flou adjustable bed base is fitted with an electric command device that changes the position of the head, the back and the legs to achieve a ‘custom’ position, ideal for relaxation, for reading, using a tablet or PC and watching TV in perfect comfort. Moreover, a sophisticated check-up system safely controls the electricity dispersion and power surges, and automatically returns the base to its original position. 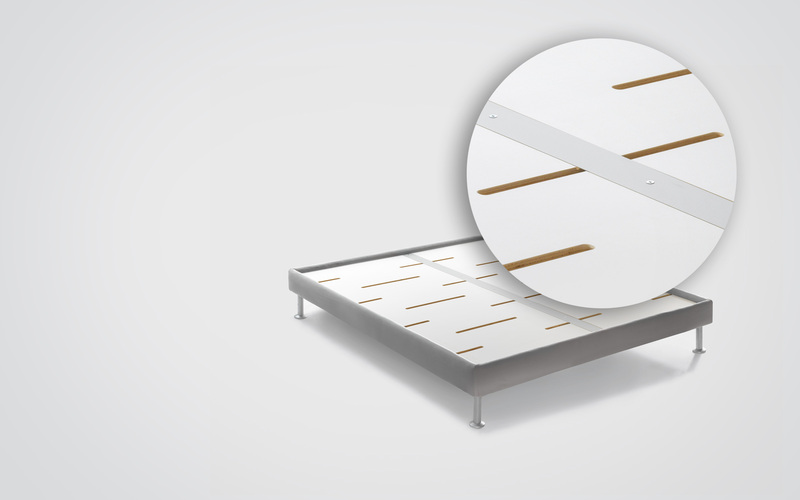 On demand, the adjustable bed base can be supplied with a synchronizer: a cable that allows the two mattress supports of the double-size bed to move simultaneously into the same position. Motorized device fitted with a control switch: in the event of power surges or failures, this will keep the magnetic fields in the socket and not in the mattress support. Battery: in the event of power failure, this will return the mattress support to its original flat position. 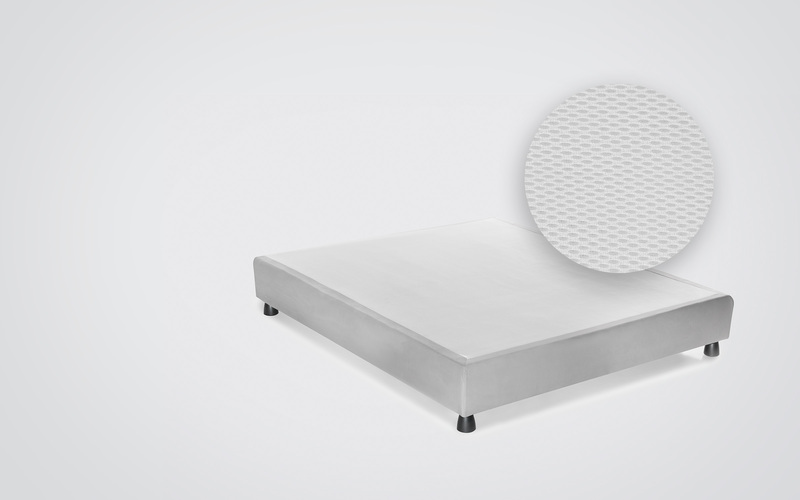 Special regulator for electric-power adjusted mattress supports. It is used to adjust the height of the mattress. the importance of using your head. Pillows have an important job to do supporting the head during sleep. They must be able to guarantee the correct physiological position during sleep. 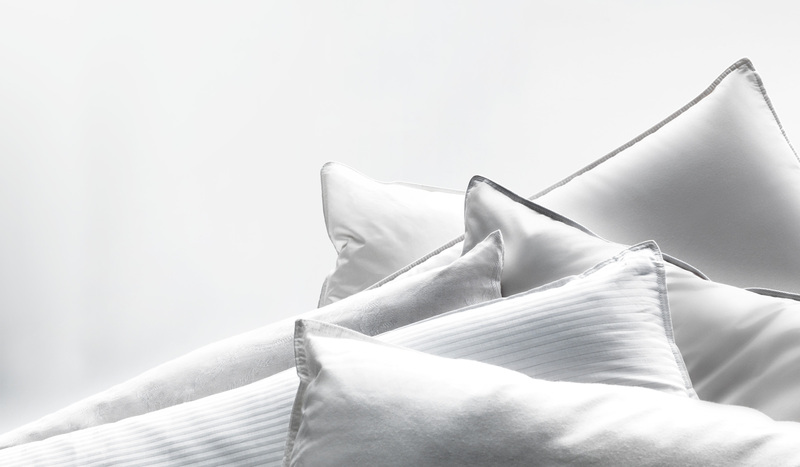 To support the head and neck, pillows must be able to reduce the pressure points as this will avoid problems with circulation and ensure perfect transpiration in relation to the body’s position during sleep. Flou’s vast range of pillows includes traditional styles and more avant-garde, in terms of shape and materials. They can satisfy every specifi c request to guarantee the best level of wellness for everyone. 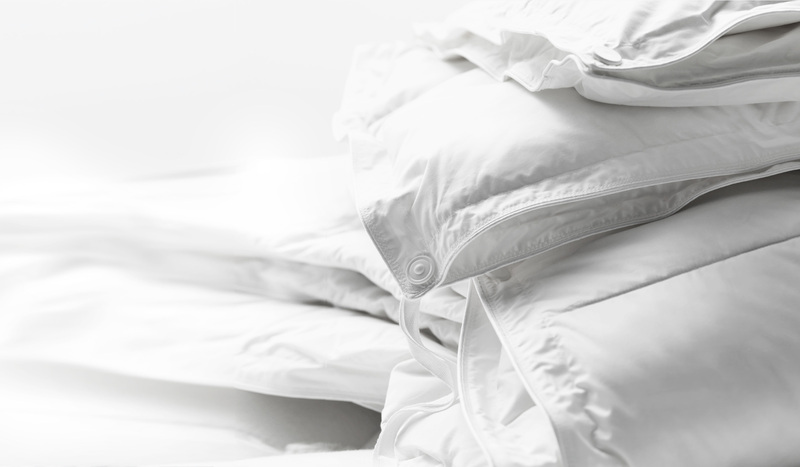 The wide range of Flou duvets has been studied to transform every night into an experience of absolute wellness. 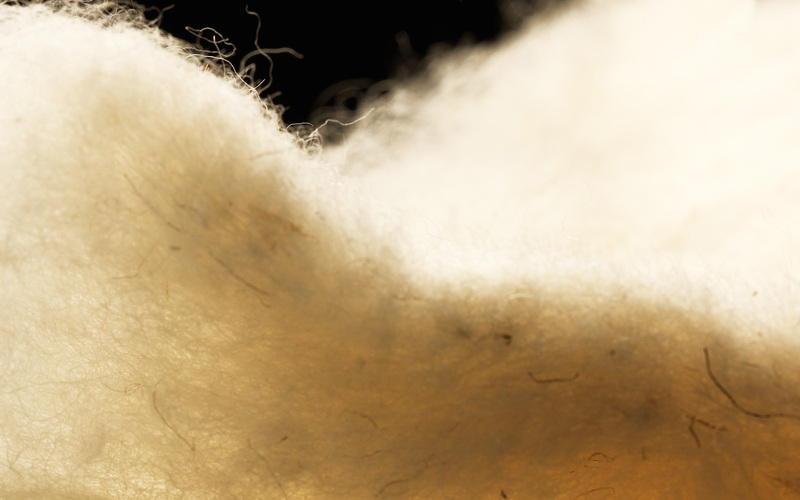 Starting from the careful selection of highest quality raw materials - traditional Hungarian goose down - to the most innovative developments - the fiber consisting of bioceramic particles and silver for the Total Body duvet - the Flou duvets have been designed for heat regulation and to maintain a constant body temperature, guaranteeing the dispersion of damp released during sleep and guaranteeing complete transpiration. 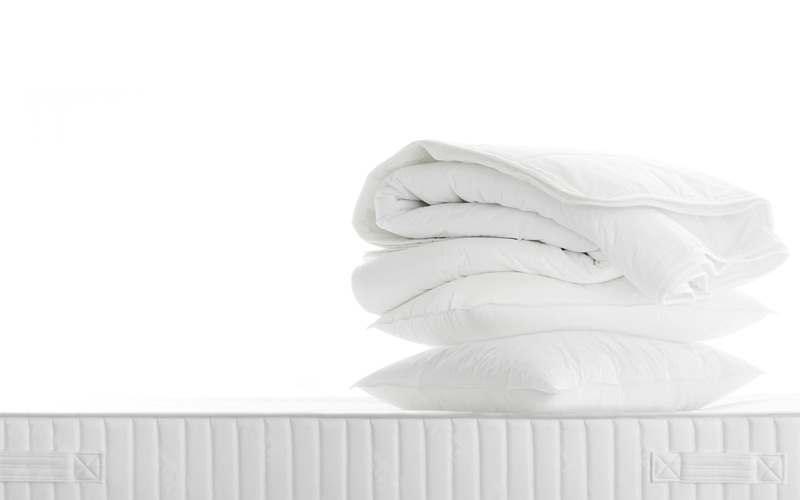 Moreover, each Flou duvet is available in the 4-seasons version, created by joining two duvets of different weights to customize the duvet and ensure the correct duvet weight for every season throughout the year. 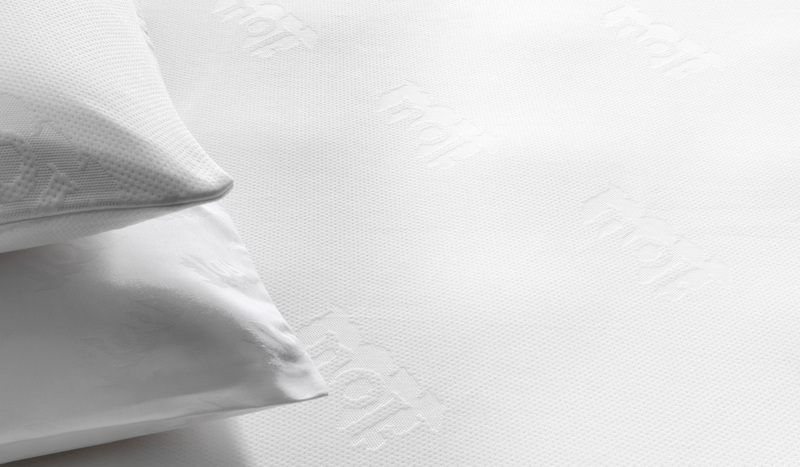 Flou’s mattress and pillow protectors guarantee maximum hygiene, exalting and safeguarding the function of the products. 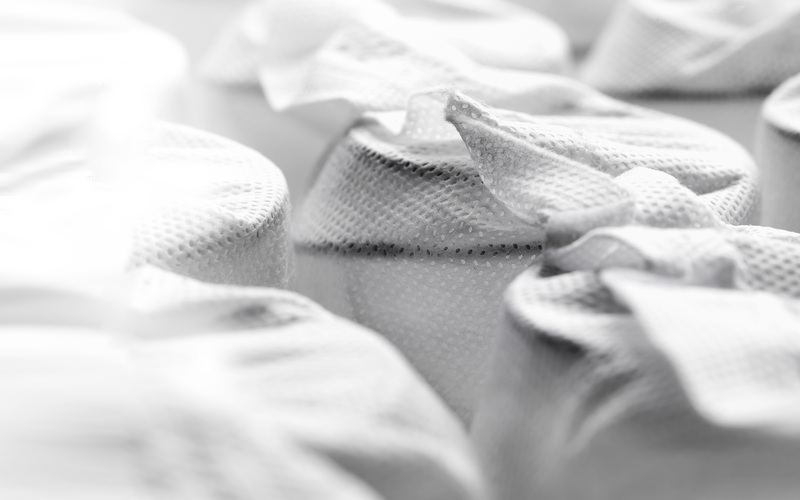 The traditional materials such as pure cotton ticking and soft toweling are now joined by the innovative line in Bayscent® Neutralizer, an exclusive Flou fabric that protects the mattress and pillows, blocking unpleasant odors, maintaining a neutral smell. 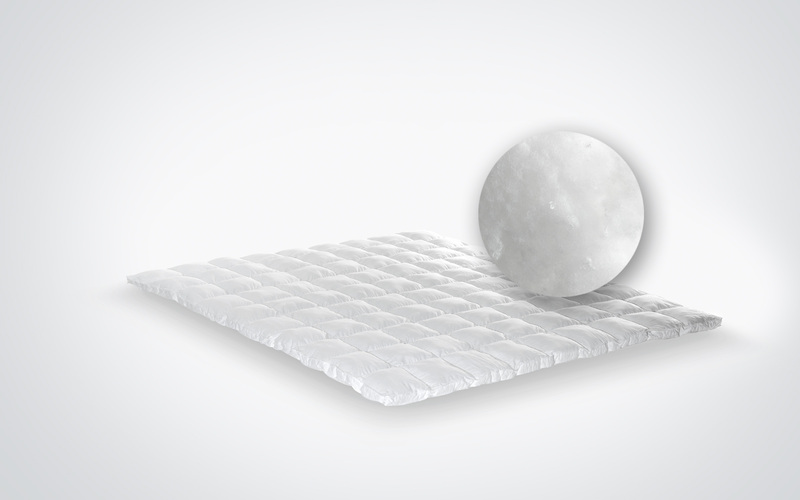 These products have been manufactured with natural anti-bacterial materials that have high transpiration properties and can disperse any excess damp, the Flou Toppers are anatomical and have been designed to be placed on top of the mattress and increase the efficiency and the comfort of the products even more. 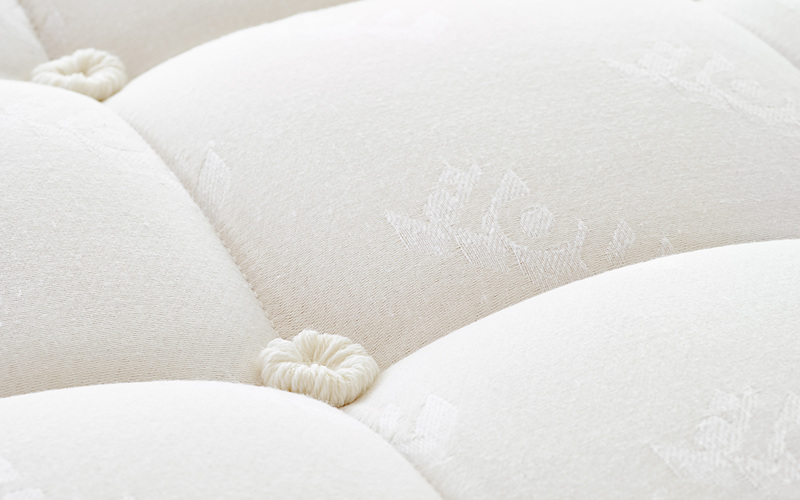 The Flou Toppers are available with three choice options: anti-allergenic fiber, goose-down and Memoform. External cover material: 100% cotton, machine washable. External cover treated with Tefl on® is stain-resistant and water-repellent. External cover 100% cotton, fi lled with anti-allergenic fi ber padding with a high transpiration power, 5 cm thick. It is produced in sections to allow the perfect circulation of air. Excellent anti-bacterial properties. Machine washable. 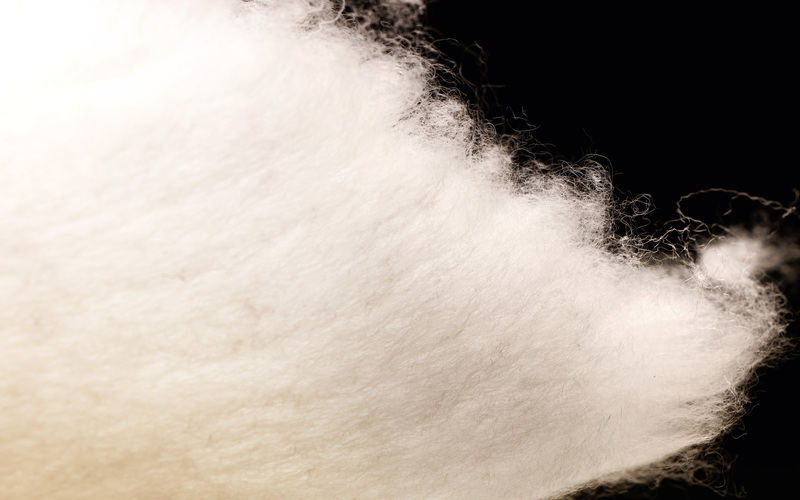 Filled with goose down that has been certifi ed and is traceable, with high heat-regulating power. 5 cmthick.It is produced in sections to allow the perfect circulation of air.